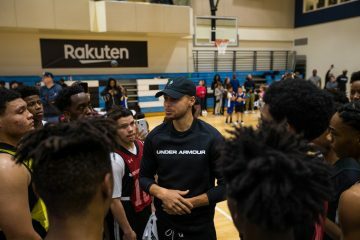 While a gym full of high school basketball players warmed up for Stephen Curry’s Underrated Tour in Oakland last Friday, a group of young women from Girls Inc. filed into the Rakuten Performance Centre, the practice facility of the Golden State Warriors, for the start of a special Future Leaders Experience presented by Rakuten. 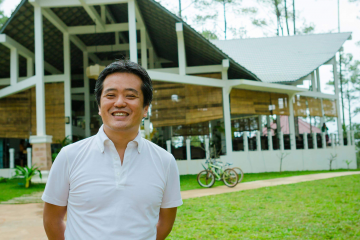 Two youth empowerment initiatives, one key message: With hard work and self-confidence, anything is possible. Underrated Tour players put their hands in for a cheer after their championship game on March 30. “It doesn’t matter what anybody else says about you. 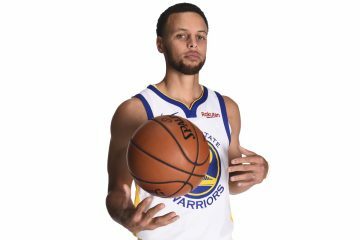 It doesn’t matter where you start — I’m a prime example of that,” Stephen Curry told athletes during a surprise locker room pep talk on day two of the Rakuten-powered tour. 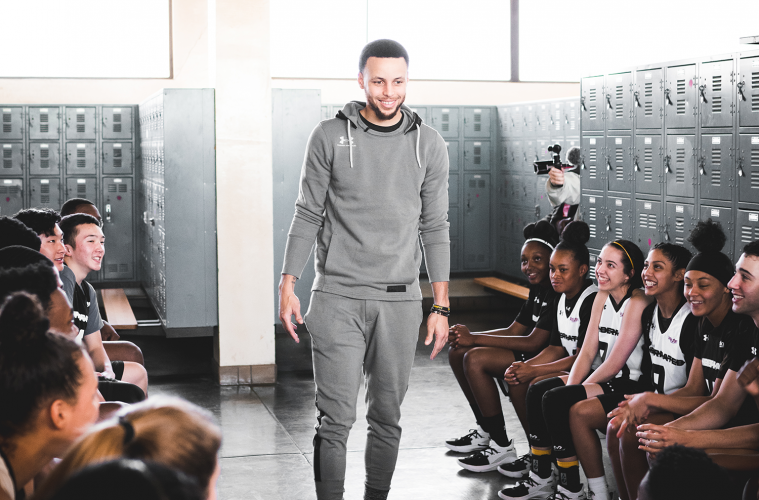 For the players surrounding Curry — 22 locals and eight “all-stars” selected from previous tour stops around the country — it’s a story they know well. “It’s not about what others say you can’t do. 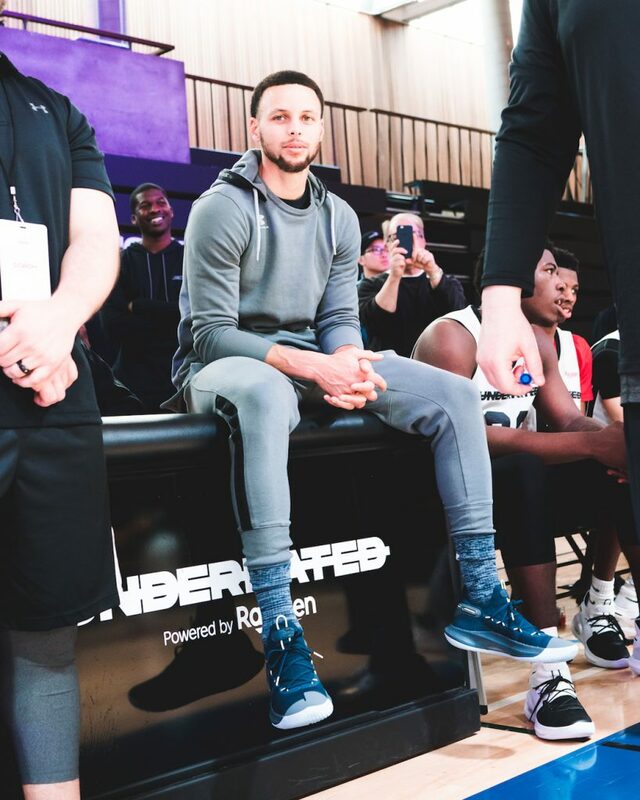 It’s about the work that you put it and the attitude that you have,” Stephen Curry shared with athletes at the event. Curry hopes that kids who feel underrated or overlooked can take inspiration from his rise. 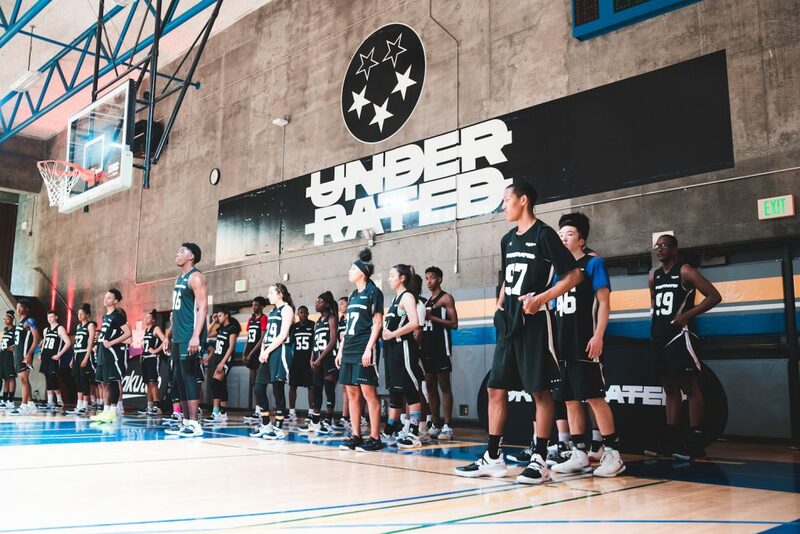 Eight standout players from previous Underrated Tour stops across the country joined the final stop in Oakland. With the tour concluding in Oakland — the place where Curry’s professional journey began — the event was bound to be special. On day two of the camp, doors were open to the public and the gym quickly filled with local Warriors fans. At half time, the audience got a chance to compete in a shooting competition that had competitors race to hit three shots — a lay up, a free throw and a three-pointer — in the shortest time possible. 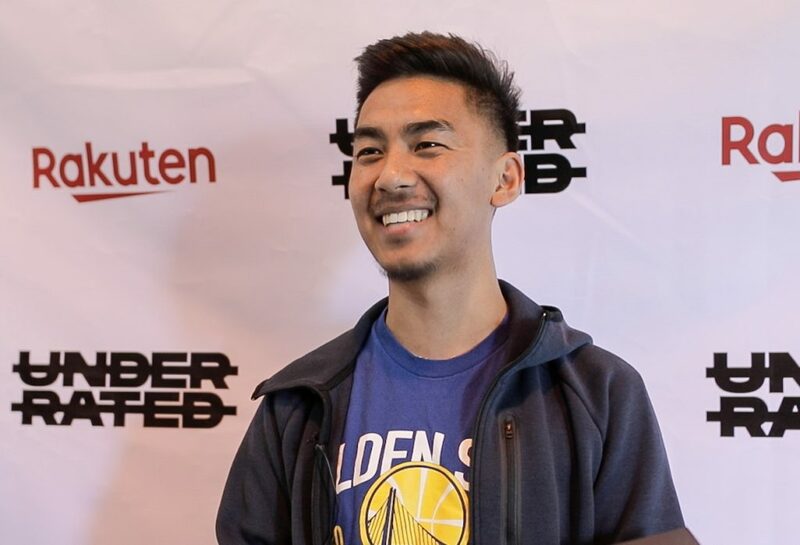 Berkeley resident Nawang, who took home top prize, a Stephen Curry jersey, was amazed by the energy he saw at the venue. “It means a lot to see big name players like Stephen Curry come out and spend time in the community like this,” said local resident Nawang, who came to cheer on the athletes. Angel, who came to cheer on her cousin and also took part in the shooting contest, had seen Curry just a month prior when he visited her school. “It’s amazing because not many girls get this kind of exposure,” said Angel, who was supporting her cousin at the Oakland stop. The parents and guardians in attendance also received their time in the spotlight. 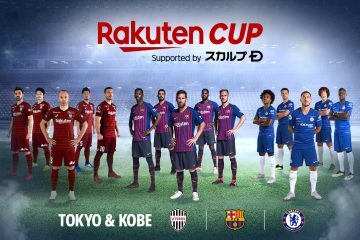 During the halftime break, Rakuten invited a group of guardians to center court to receive bouquets of flowers for the vital role they play in the growth and success of their children. Curry poses with parents and guardians after the championship game. Adding to the excitement of the event was the presence of Curry’s Warriors teammate Quinn Cook (a player with a remarkable underrated story himself), who dropped by the gym to take in the action. Cook took time to pose for photos, talk to players and show off some skills after the event. 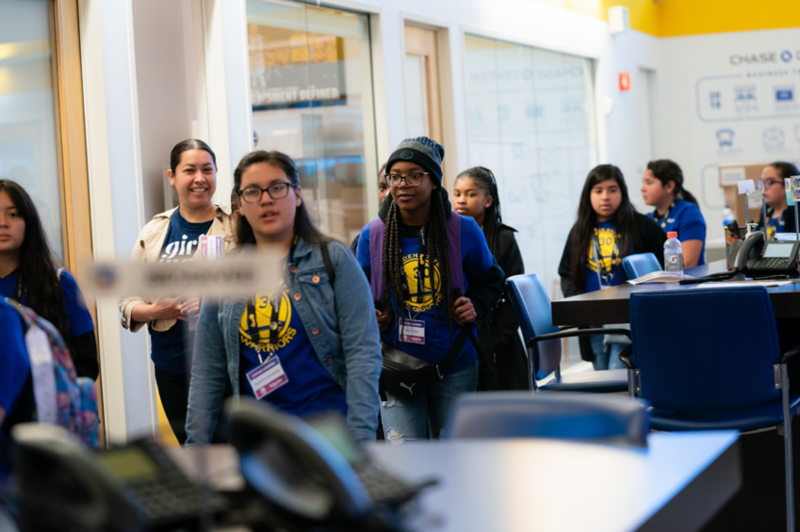 Middle schoolers from Girls Inc. of Alameda County toured Warriors HQ before being paired with mentors from the organization as part of a special Future Leaders Experience. 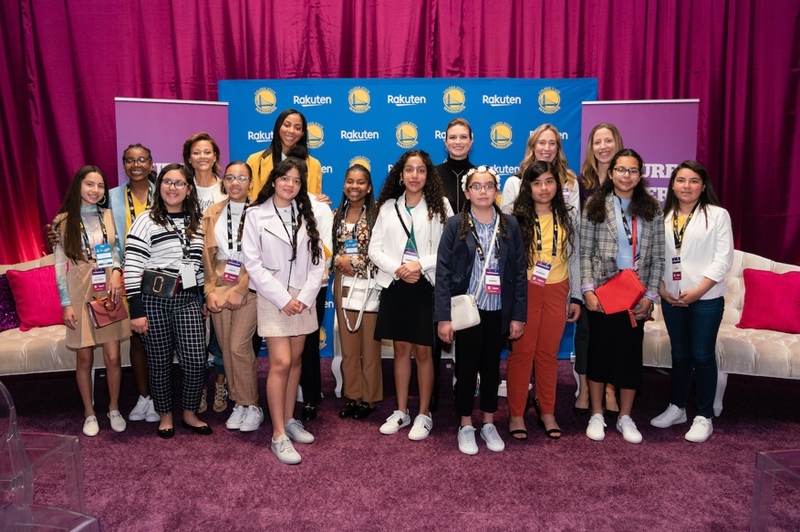 On the same weekend as the Underrated Tour came to Oakland, middle schoolers from Girls Inc. received the opportunity to shadow mentors from the Golden State Warriors and see firsthand what it takes to be a successful woman in the world of sports and business. 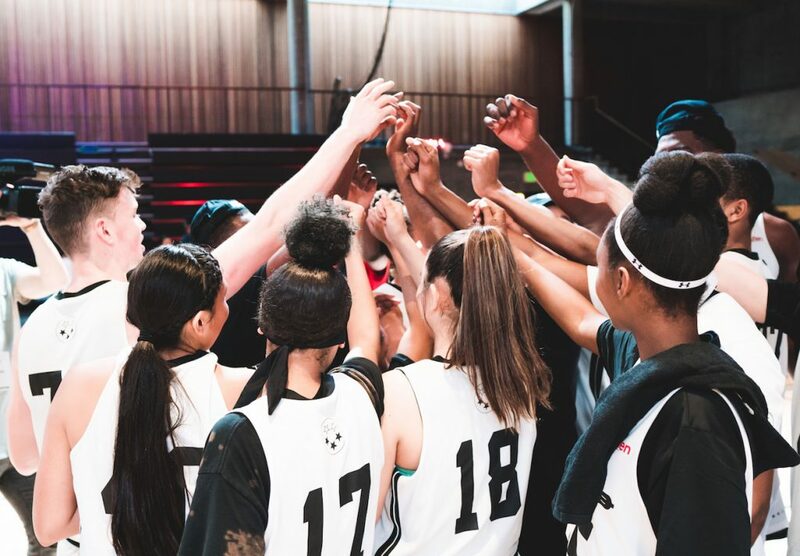 The Future Leaders Experience started with a tour of Warriors HQ, where the girls met the women they would be shadowing at a Warriors game two days later. 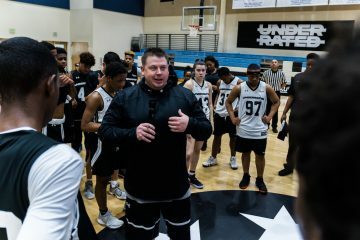 The meeting was followed by a team lunch, where they were joined by Lindsay Gottlieb, head coach for the University of California Women’s basketball team. After sharing her story and stressing the importance of dreaming big and staying true to yourself, Gottlieb surprised the group by revealing they’d be heading to Nordstrom to pick out business professional outfits, with the help of personal consultants. 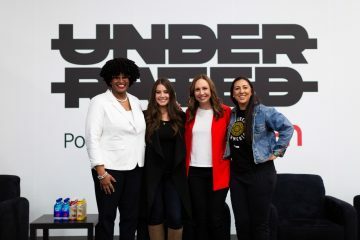 Girls Inc. participants were treated to an all-star panel discussion featuring WNBA legend Candace Parker; Stephen’s mom, Sonya Curry; chief operating officer of Ebates, Adrienne Down Coulson; and head coach for the University of California women’s basketball team, Lindsay Gottlieb. Two days later, before the Warriors tipped off against the Charlotte Hornets in Oakland, Girls Inc. participants were treated to an all-star panel discussion featuring WNBA legend Candace Parker; Stephen’s mom, Sonya Curry; chief operating officer of Rakuten Ebates Adrienne Down Coulson; and once again, Lindsay Gottlieb. The panel was hosted by Warriors Sideline Reporter Kerith Burke. 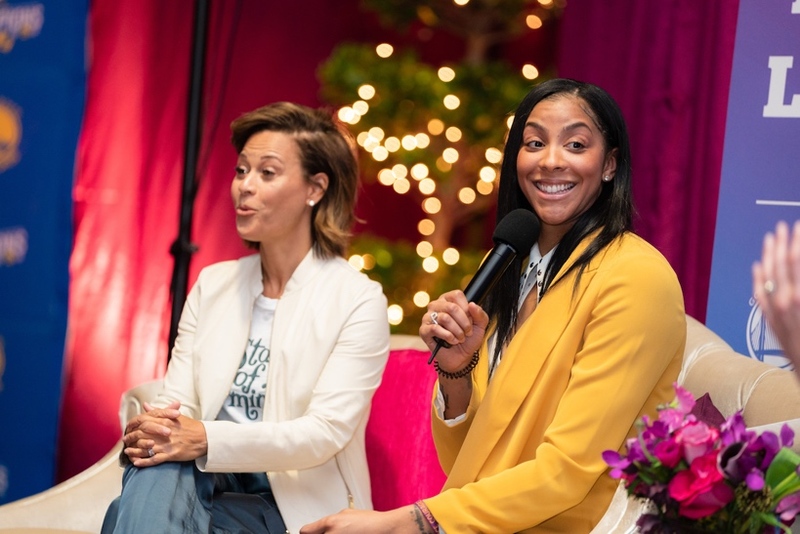 Candace Parker (right) spoke about the female mentors who inspired her growing up, including legendary women’s basketball coach Pat Summit and her own grandmother. Many panelists echoed the value of learning. 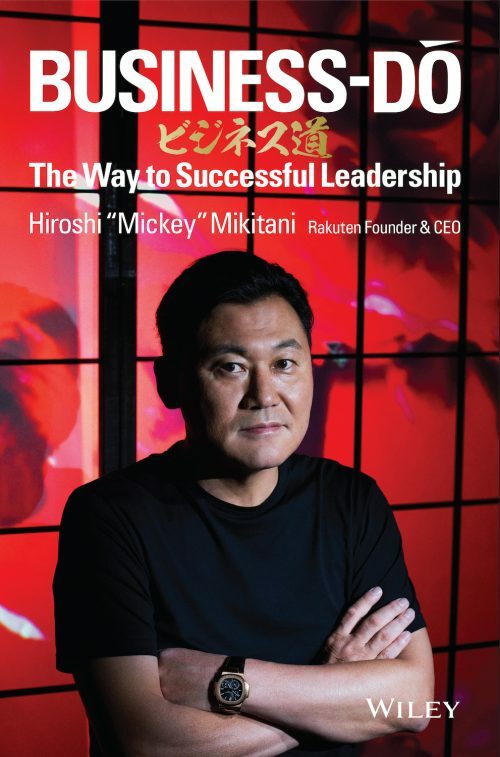 “Education for me is very, very important. 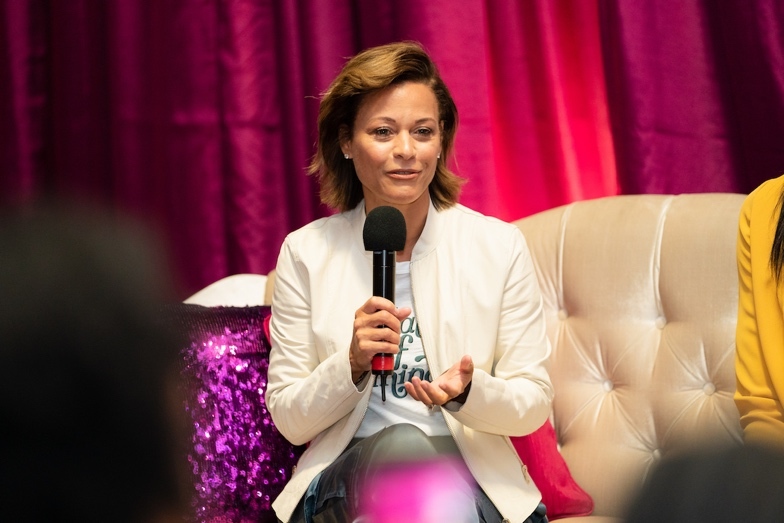 You have to fuel your mind and the rest will follow,” said Curry, who founded the school that all her children attended when they were the same age as the girls in the audience. 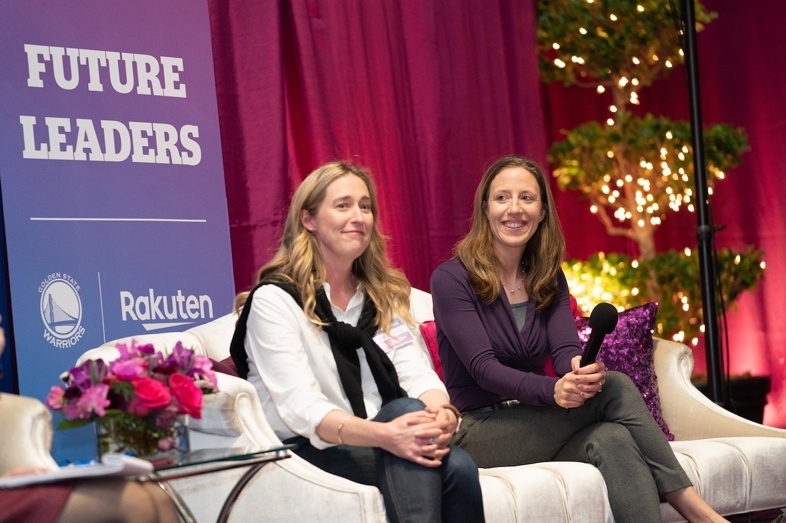 Speaking to a crowd of young women from Girls Inc., Adrienne Down Coulson (left) and Lindsay Gottlieb (right) stressed the importance of staying true to yourself and pursuing your passions. Her first week in university, she joined the school newspaper, where instead of writing or editing stories, she focused on the business side. For the next four years, she worked 40 hours a week on top of a full course load, eventually rising to the ranks of managing editor. This gave her a passion for and understanding of business, which — paired with valuable coding skills — led to great success in the tech world. 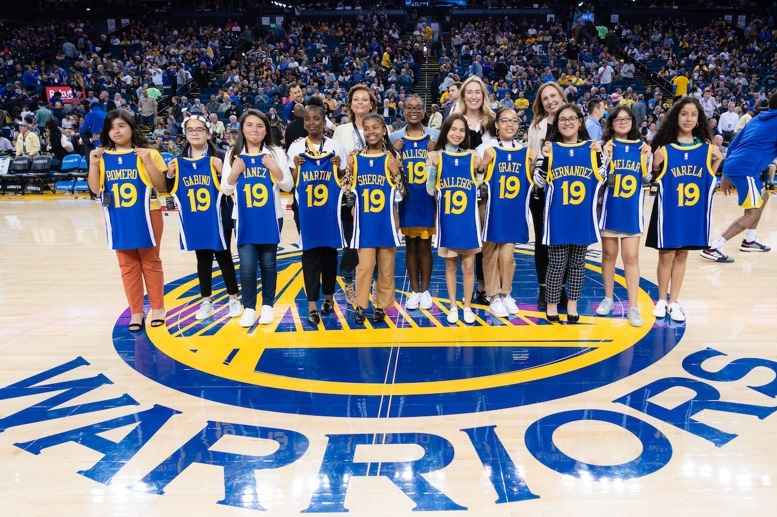 Girls Inc. of Alameda County with Sonya Curry (back left), Adrienne Down Coulson (back center) and Rakuten director of sports and entertainment Kristen Gambetta (back right) being recognized on court during halftime of the Warriors game on March 31. Following the panel, the girls met up with mentors to prepare for the game. From ticketing and VIP services to on-court programming, participants experienced firsthand what goes into putting on a world-class sporting event. 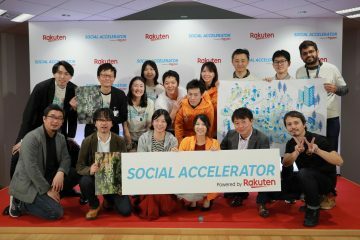 After putting in some solid work with Warriors staff, including a sideline pitch for audience members to download the Rakuten Viber app that showed on the Arena Jumbotron, the young women and their mentors retired to the Rakuten suite to take in the action. 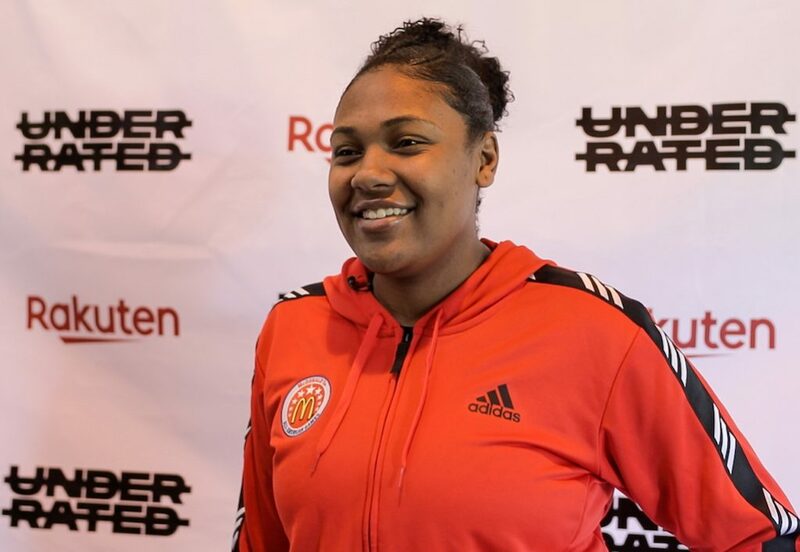 Girls Inc. participants didn’t just work behind the scenes; several were featured live on the Arena Jumbotron before the game. 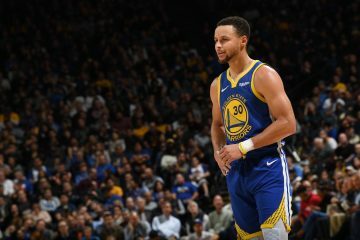 They watched with delight as their hometown Warriors defeated the Charlotte Hornets 139 – 90, their largest margin of victory for the season. 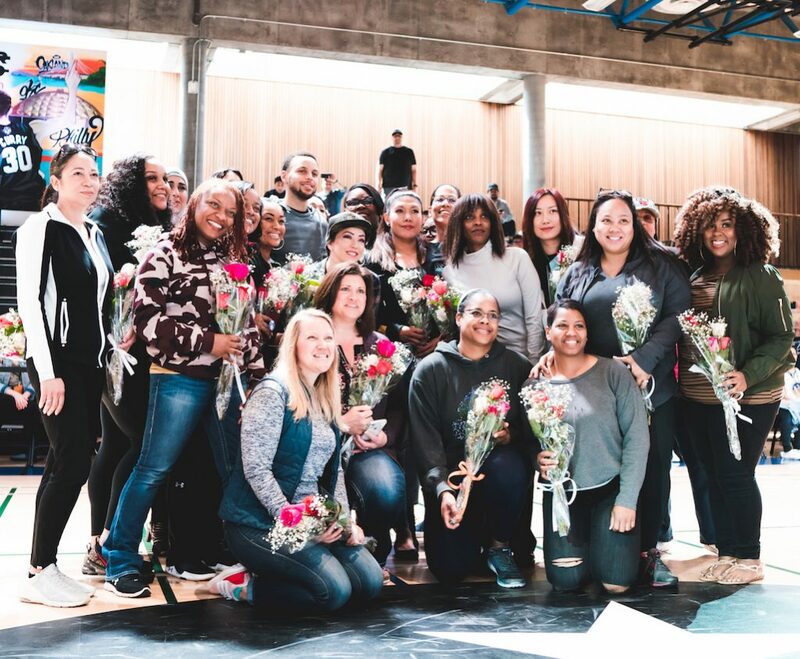 For the future leaders of Girls Inc. of Alameda County, it was yet another highlight from an unforgettable weekend with the Warriors.